Blogging about Dynamics AX Technical and Development things, and a few other computer related things. 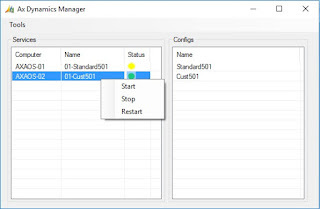 I previously made a program to list, start and stop Dynamics AX Services. This is version 1.02 see change list at the end of the post. This version will still handle list, start and stop of services, but also restart of services, and it will also support multiple servers. 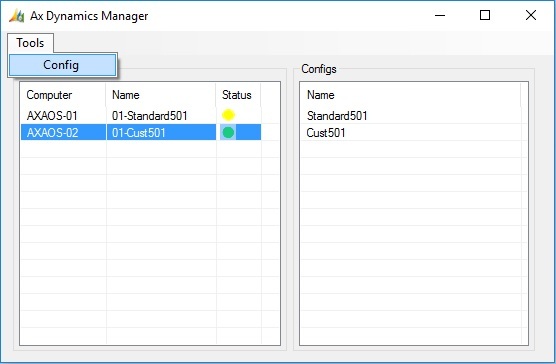 And as something new i have added the possibility to start your Dynamics AX from the program, supporting multiple configurations. The program is tested for AX 2009 and AX 2012. On the left you will see the list of services that you have, and on the right the list of possible AX configurations. Under the menu item, Tools/Config, you can change the programs settings. Here you can add/remove computers to look for services on. To remove a computer from the list, double click on the item. To add a computer, input its name in the text box, and press the "Add" button, or enter. The refresh field controls how often the service list will be refreshed. If you right click on an item in the service list, you will get this menu, where you can start, stop or restart a service. You can also control a service by double clicking on it, double clicking on a started service will stop it, and on a stopped service it will start it. If you right click on an item in the Config list, you will get this menu. 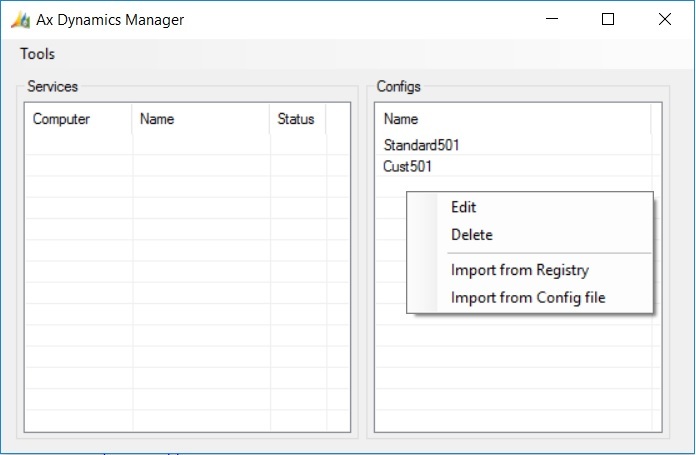 Imports all AX configurations from the registry. Imports one configuration from an AX configuration file. If you double click on an item in the Configs list, that Dynamics AX will be started. This function requires that the right version of AX is installed on the machine. Add a counter of online users on the AOS. Group services, so you can start, stop or restart an entire group in one go. 1.02 : Fixed error with parmBinDir not beeing read from AXConfig file. Added parmBinDir to EditAXConfig form. 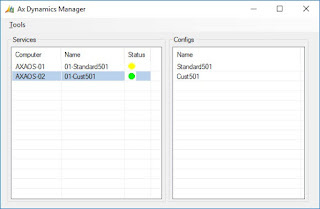 Fixed error when there are no AX Configs anywhere. Fixed error with BinDir not being read from AXConfig file. Fixed EditAxConfig form, field TabIndex, and the position of the OpenFile buttons. Added check if the paths in ParmBinDir and ParmLog exists before starting AX. Added check for double backslash in filePaths when importing configfile. Added handeling of multible AOS servers for parmAOS2. Added for to Edit AX Configurations. 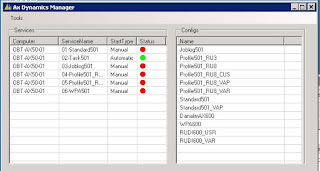 Import of AX Configuration from .axc files. Made it possible to delete an AX Configuration from the list. Function to check last program version and do config cleanup. Please do leave a comment if you find the program useful, have a bug or a suggestion for a change. I also like your planned changes, looking forward to the next version. 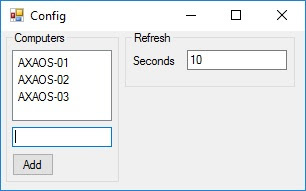 I will have a look at the GUI first posibility i get. About the import of the config file, can you share your file with me, i can't get the same error with any of mine. See the following link for a zip file that contains the .axc, the complete error message and the .csv file with the line that causes the error. I put up a new version 1.03 with the fix for your problems and more. If you start ax32.exe with -startupcmd you can use this to automate some tasks. Like for instance this command will perform a full compile of all elements in AX. Here is a full list of all the startupcmd parameters in AX2009 and AX2012. The code that controls this can be found in Class SysStartupCmd method construct. You can also add your own commands by adding them to this method. This is version 1.05 see change list at the end of the post. To remove a computer from the list, double click on the item. To add a computer, input its name in the text box, and press the "Add" button, or enter. The refresh field controls how often the service list will be refreshed. I made this little tool to help translate Label files in AX. 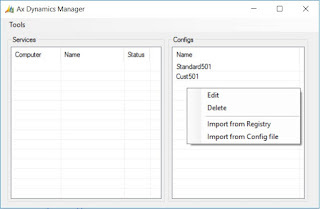 The process is that you export the labels you want to translate from AX, run the C# program that translates all the labels using Bing Translate, and then imports the new Translated labels into AX. You do need access to Microsoft Azure to use the tool. And also Visual Studio to compile the C# program. This is the first version of this tool, so its not 100% tested and still needs a lille work. But at least it gets the job done.